The Indro Montanelli park in downtown Milan in three days in May 2014, during WIRED NEXT FEST was a meeting point of the best of Italian digital culture. Spread within seven dome-shaped tents, from the Museum of Natural History to the playgrounds for children, with free chocolate bars on every stand, the display of the ideas and technologies for future gave me a warm feeling for the prospects of Italian society. Italy is always on the verge of being too conservative, probably because there is so very much to conserve. Odd conferences, vivid performances, live music and even a loud demonstration of angry cab drivers, which brought the famous Italian street rebels to the venue, along with a crowd of Milanese cops in full riot gear. These cab drivers were opposed to the use of “Uber,” a smartphone application which would disrupt their business model. Phones and databases are taking away jobs from humans — a kind of networked Napster for cars. An American attendee told me, amazed: but I just came here from California, there people were delighted to have cheap, fast cabs with just a phone app! Such an improvement for every passenger and cab user, what do these taxi people want for themselves? A cab driver explained: we are already overtaxed, underpaid, the state is not taking care of us! 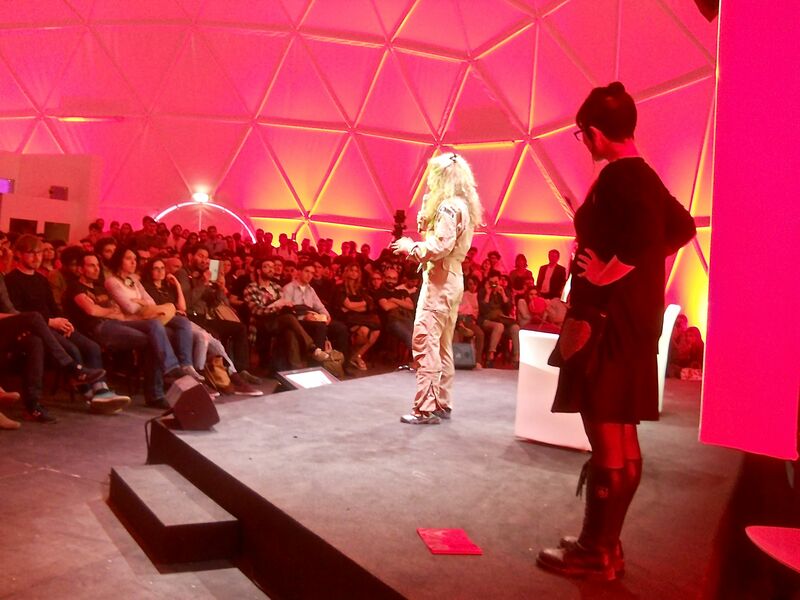 A businesswoman from UBER was at the festival to explain her company’s arrival in Milan. However, she was shouted down with firecrackers, bullhorns and derisive threats, so she stepped aside so that the show could go on. She was expecting the trouble, I was told. Sometimes she receives death threats because of her phone application. We must find a way to be serious about these new and potent things in the world, the applications, the robots, the Internet mega-companies; they’re not mere technical wonders of pure and painless progress. The Oscar winning movie director Gabriele Salvatores, director of the cult SF film “Nirvana,” broke out in indignation when pressed for his reaction to recent Internet developments. He scolded Facebook for abusing privacy and wondered aloud how Europe could fail to defend elementary civil rights online. It’s no longer the electronic world he knew, said Salvatore, back when he read the first cyberpunk books. The Piemontese inventor of MPG standards said that digital music is accessible and fast, which is good — but that technical achievement didn’t have to mean the ruin of the music industry. Instead, he expressed disappointment with a society in which not just music standards, but seemingly every similar invention has been turned into a model for economic crisis, and the concentration of power and wealth in the hands of a few. Italian astronaut Luca Parmitano, known as @astro_luca to his many social-media admirers, spent six months in orbit in the International Space Station. He described watching the planet Earth every night through the space station’s glorious European windowpanes. The explorer told us that there is no better joy in human life than to control the human fear of the unknown and direct that into great discoveries. Awestruck Italian children demanded his autograph. Alex Bellini is a young Italian adventurer set on superhuman endeavors such as living inside a iceberg, or rowing across entire oceans. Bellini told us that his major interest is exploring the limits of human physical and mental abilities. It was remarkable to see this traditional Italian derring-do turned into a life-story performance project. Near Future Design fiction is a new form of creativity where designers, artists and writers think and test their ideas freely by creating on the spot future scenarios. Salvatore Iaconesi and Oriana Persico led a big workshop, using the topic of telepathy and uploading the results to Facebook. Then came a cavalcade of internet video celebrity talk shows, musicians, novelists, celebrity chefs, break-dancers, scientists, and raucous comics with politically non correct agendas! Thirty-thousand everyday people enjoyed the famous Giorgio Moroder DJ concert in the park, where electronic Italo-disco blasted over the happy masses. This entry was posted in Uncategorized and tagged cab drivers, Facebook, Gabriele Salvatores, International Space Station, milan, Museum of Natural History, next fest, The Oscar winning, Wired. Bookmark the permalink.